After a week of gorging ourselves on pintxos in Donostia San Sebastian and Bilbao, Mrs. SF, my sister, her husband and I fancied something more substantial in the form of a full on sit down meal. 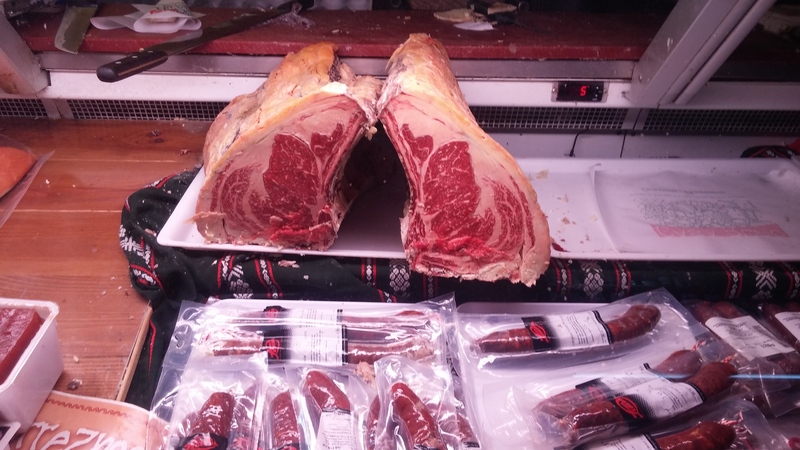 Now you don’t get much more full on than that Basque staple, the chuleton/txuleton – a huge hunk of aged beef (usually from old milkers) on the bone. 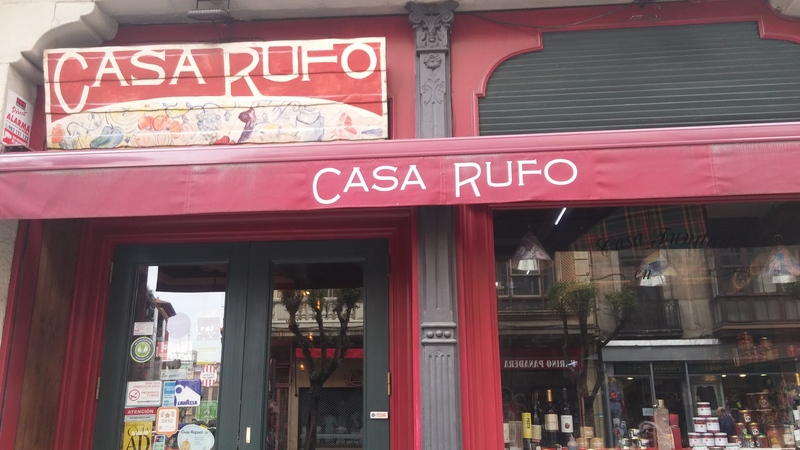 Anticipating this I had booked Casa Rufo, a place whose speciality is mighty txuletons, in Bilbao. The exterior is rather art deco (lots of that in Bilbao – there is a lovely art deco food market by the river) and doesn’t suggest a restaurant at all. 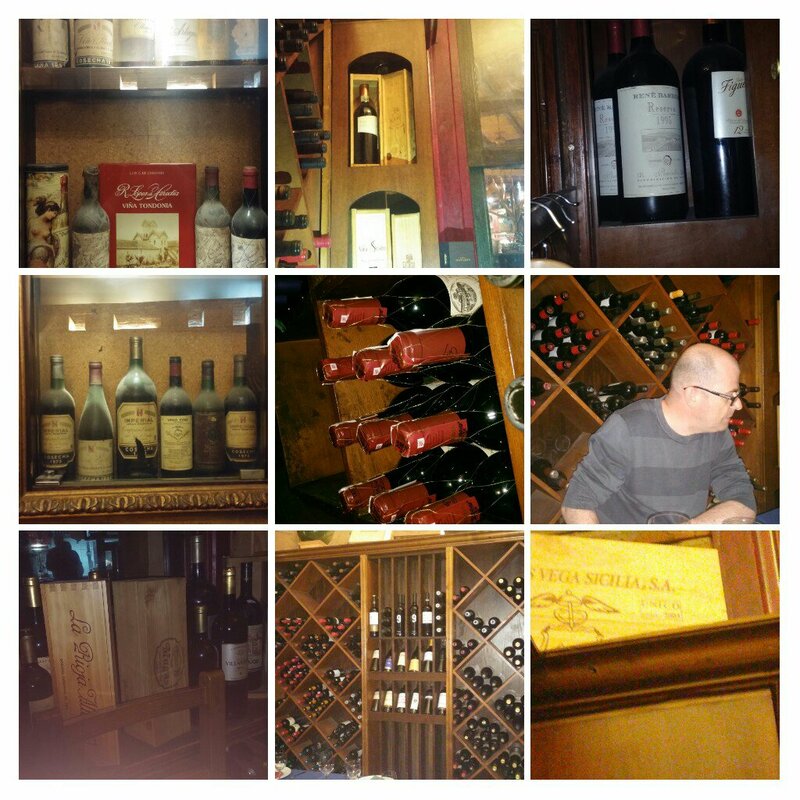 It is a funny old place inside, looking more like a deli/wine shop than a restaurant – bar from a few tables. We had scoped out where it was in terms of our apartment (nice with a great location within sight of the Guggenheim and very close to the old town) in the morning to see how far it was (I hate being late for anything) and it looked seriously closed, with dimmed lighting only and no staff evident (we assumed it opened at lunch time as we had booked). When we arrived (for our 2pm booking) it still looked seriously closed and a couple who were peering through the door walked off (seemingly assuming it was closed on the day – quite a few places were as it was Easter Saturday). We peered in and saw dimmed lighting, no staff and no one in the shop/restaurant and nearly concluded the same, but we had booked so tried the door and lo and behold it swung open and Mr Benn- esque the shopkeeper appeared (looking worryingly surprised to see us). He spoke very minimal English and I speak very minimal Spanish and I was expecting a brusque ” Estamos cerrado”. 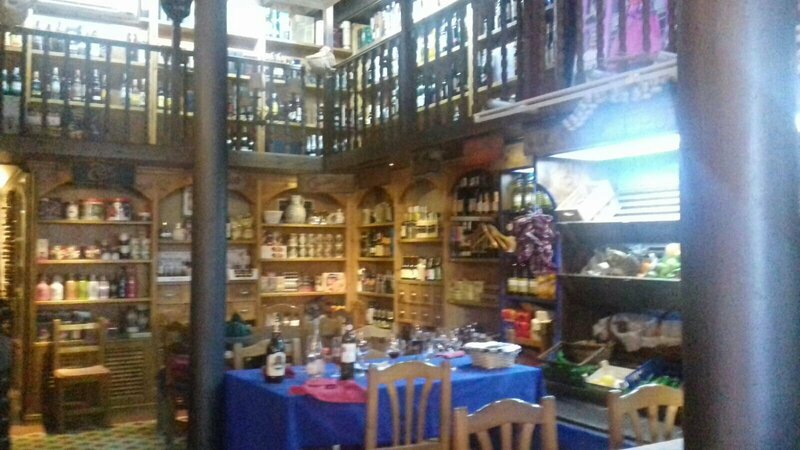 Luckily with my pigeon Spanish I managed to explain we had a booking and we (all somewhat relieved) were taken through the tardis like interior to a back room of my dreams, with wall to wall racks of wine (very good wine too). I was, it is fair to say, somewhat excitement in terms of what the wine list was going to be like. We were the only people in the place bar from staff for a short while before it started filling up and by the time we got our food it was packed. My advice is book and even if it looks closed try the door. The menu centres on home smoked stuff and fish and meat cooked over charcoal. 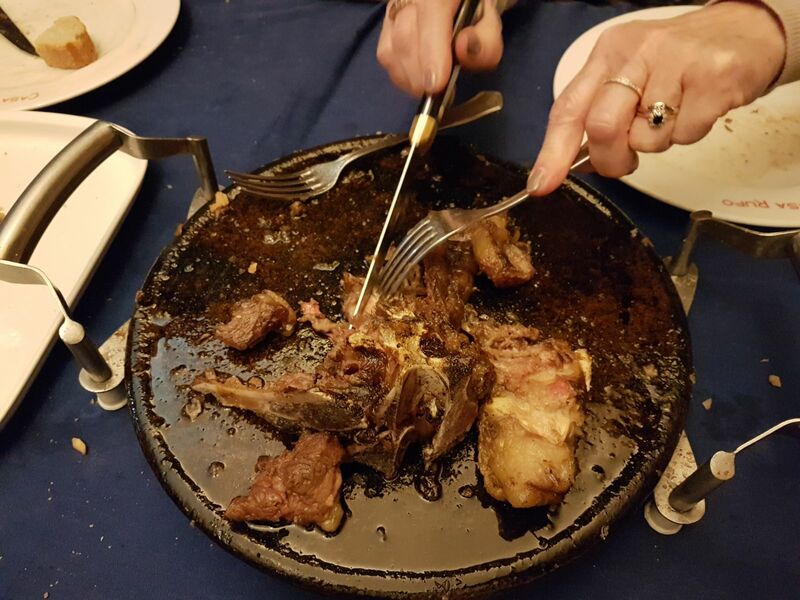 In terms of starters, we have learnt when in Spanish asador type restaurants it is best to share what is on offer starter wise, with the “starters” being pricey because they are generally huge. 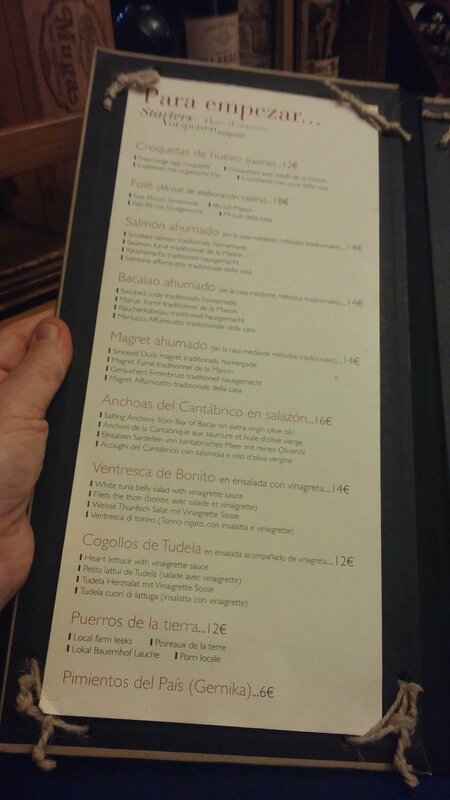 We got caught out on this at Rekondo in Donostia San Sebastian. There we all ordered starters and what arrived was capable of feeding the proverbial 5000 (and bumped the bill up considerably). Lesson learned, here we adopted a more cautious approach in ordering from the rather enticing list of things on offer. 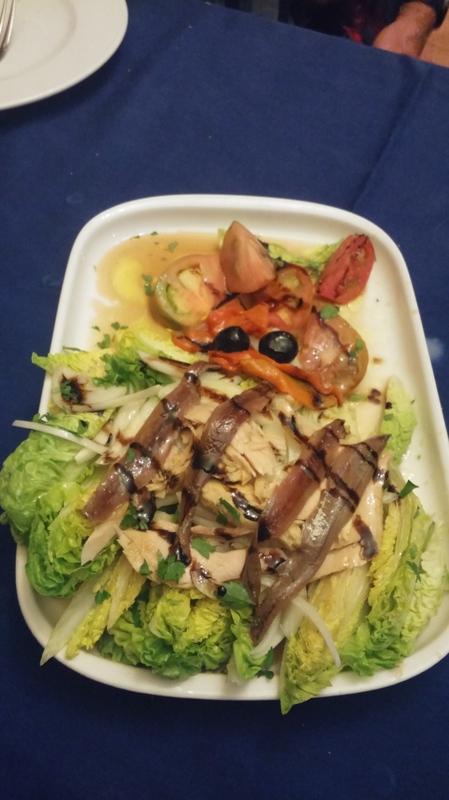 As a meat fest was to follow we decided on the “house speciality” home smoked salmon (€14) and the rather blandly titled “Heart of lettuce with vinaigrette” (€12). 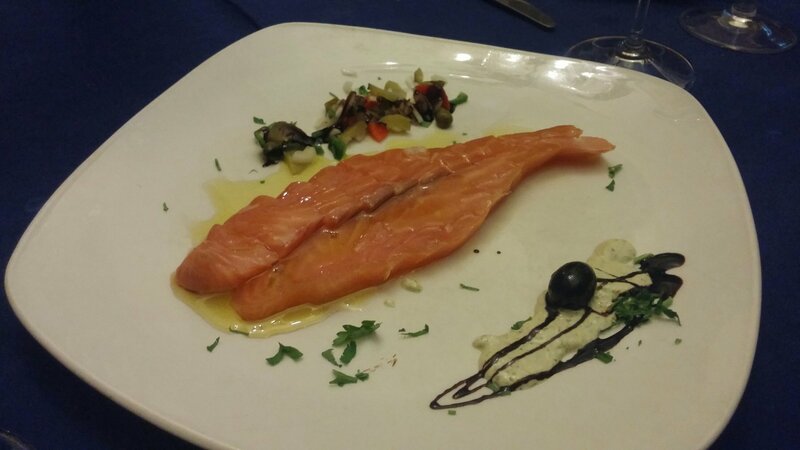 The salmon came in cubed fashioned in the sort of the shape of a fish. The salmon had a lovely light smokiness to it and a subtle cure, which really enhanced the flavour of the fish. It came with a citusy olive oil and a slightly tart emulsion that worked nicely in cutting the richness of the salmon. Lovely was our collective verdict and I may well experiment with cubing and a thicker cut when I next home smoke a salmon as it worked very well here. Next up was the “lettuce hearts with vinaigrette” which was far more than the title suggested. A massive amount of romaine lettuce was topped with a very decent amount of quality canned tuna and salted Cantabrian anchovies. To this was added some lovely (really tasty) tomatoes, peppers, olives and sweet Spanish onions. It had a liberal coating of a rather good dressing. Both were big old portions, which more than vindicated our decision to share two starters between the four of us. based on the beautifully marbled hunks of beef sitting on display as we walked in. 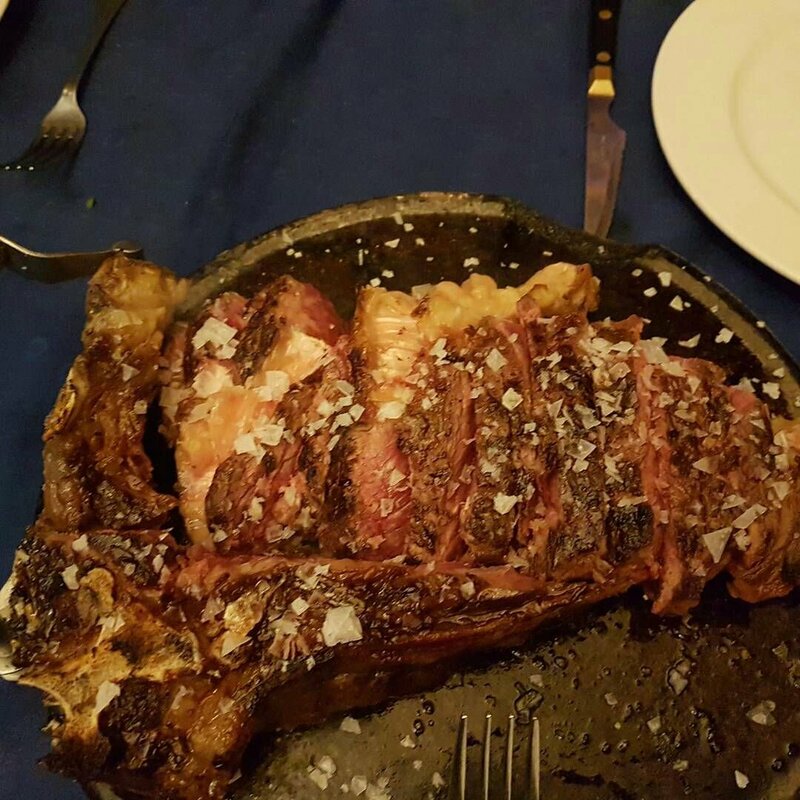 What arrived was a fantastic piece of beef (coming in at just over 1.6kg – €72 for 3 of us) with full on flavour, copious amounts of seasoning, a gorgeous exterior crust (that only a really intense heat can achieve) and lovely yellow fat. It arrived cooked very rare, but came sizzling on a very hot cast iron contraption so continued to cook at the table . My sister and I (both blood thirsty when it comes to meat) pounced and took our allocation rapidly. My brother-in-law (who like his meat more cooked) waited, with the seriously hot iron skillet doing its works in terms of further cooking. The benefit of this approach is that a txuleton can be ordered even if diners have differing requirement in terms of the level of doneness of their beef. Here everyone was very happy, with what was a fabulous piece of beef. 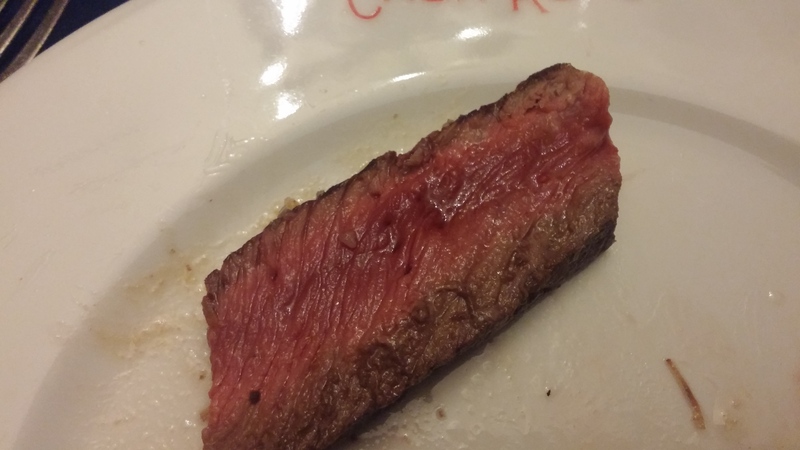 Steak often disappoints, but not here. It tasted even better than it smelt and it smelt blooming lovely. The other benefit of the hot skillet is a delicious rich, fatty, beef liquor develops on it. This, with the copious amounts of bread on offer here and the chips it came with, was mopped up with gusto by us all. A fabulous bonus. The txuleton came with no adornments or sauces (the meat did all the necessary talking – with meat this good nothing is needed bar from a liberal amount of seasoning) and the only side was a platter of the aforementioned chips. These were OK, with some nice crispy bits, but fairly regulation if I am honest. 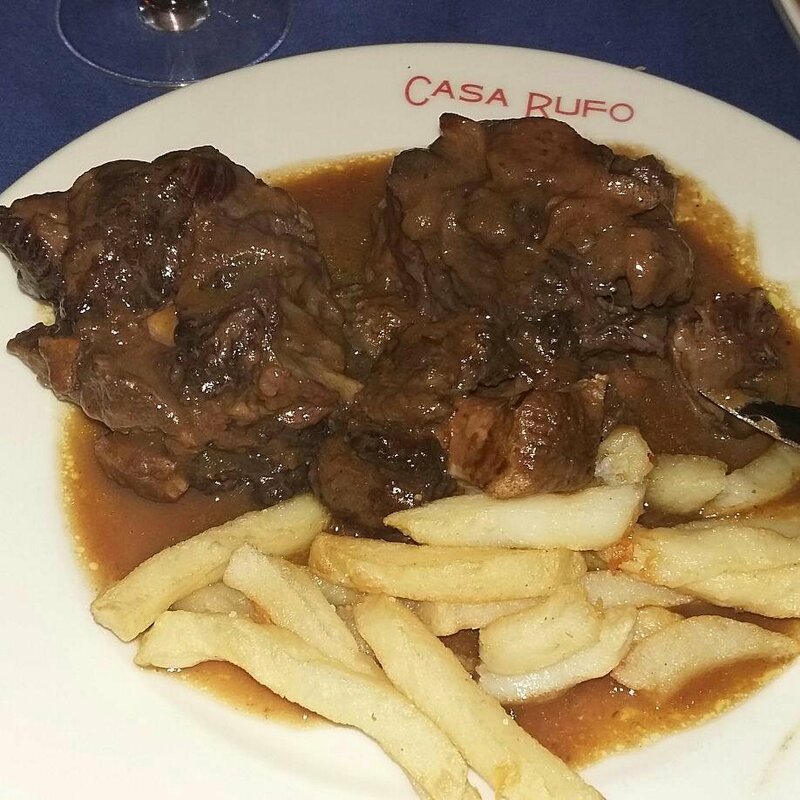 Mrs. SF didn’t fancy the steak (foolish woman) and went for a oxtail stew (€16 according to the menu). A big portion ( they don’t do small here) of lovely, fall off the bone tender, richly flavoured, unctuous meat (oxtail done properly is one of my favourite cuts of meat) in a killer gravy had her beaming and not in the slightest bit jealous of us steak eaters. Chips were, as per those with the steak, OK without really wowing. I think mash would have been better, to soak up the lovely gravy, but you rarely see it in restaurants in Spain in my experience. We were all quite full by now and decided a pudding each would be a step to far. 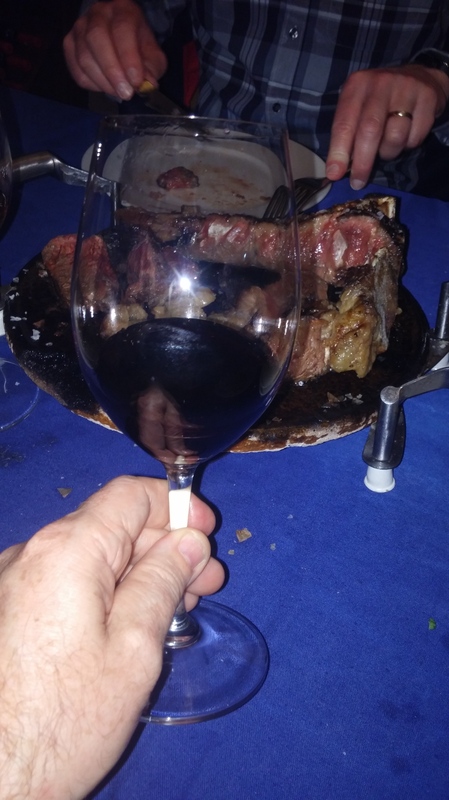 I, however, had my eye on another (particular) bottle of red so we all went for cheese (€4 a head according to the menu – for some reason it came to €15 on the bill). 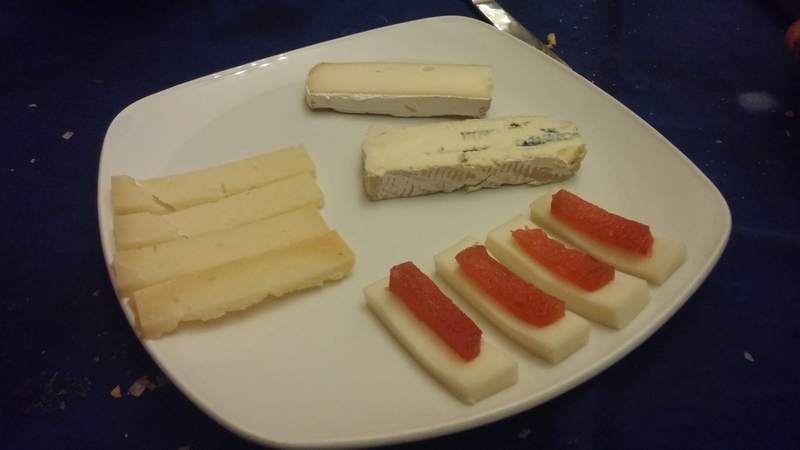 Nice (but not cheap) little selection of hard, soft and blue cheeses with membrello (quince jelly) made for a pleasing end to the meal (especially with the rather fine bottle of red wine we ordered with it). To put these prices in context, on a restaurant wine list, the La Rioja Alta 904 2004 (a comparable year quality wise to the 2005) and the Izadi Reserva 2012 are on the list at the Three Chimneys (where Mrs SF and I had our wedding breakfast) on Skye at £99 (€116) and £55 (€65) respectively. A Vina Ardanza 2007 (an inferior year to the 2010 on the list here) is on the list at Rick Stein’s gaff for £55 (€65). 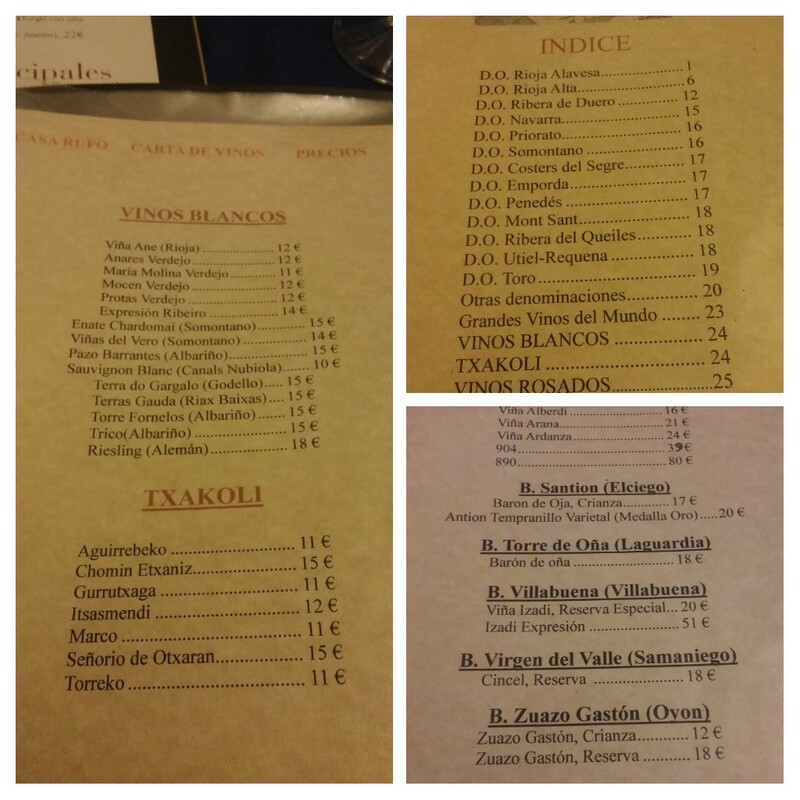 My initial choice of white of the Trico Albarino (a bargain at €15 +10% IVA – it is £50/€59 on the list at Social Wine and Tapas in London ) was not available so I decided on the Godello on the list, which was also not available. This was a very pleasant wine for the €14 (+IVA) price tag. 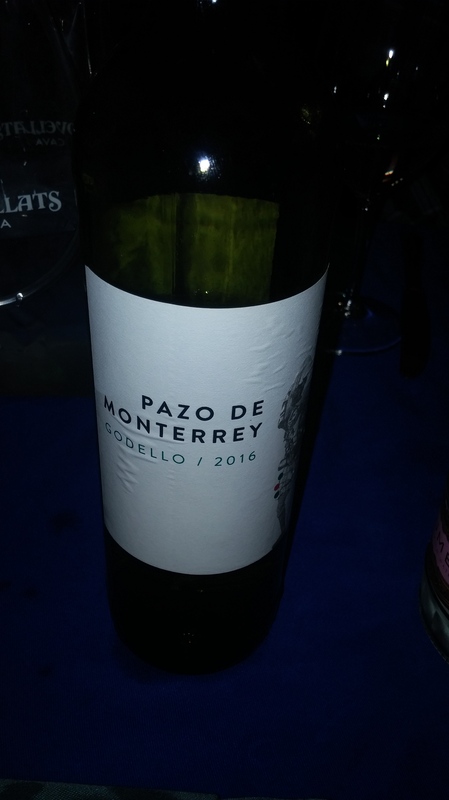 It had lovely citrus aromas on the nose and pear, ripe melon and some spice on the palate which persisted rather nicely. Spot on with the robust flavours of both the salmon and the salad. 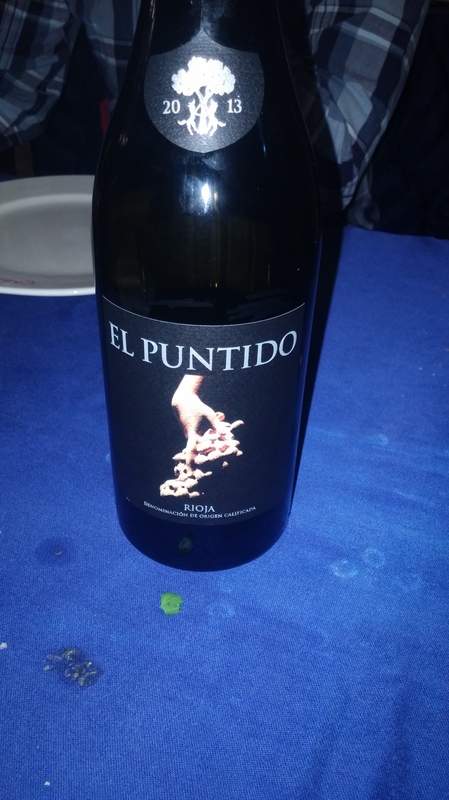 With the txuleton I had spied a bottle of El Pundito (€46), which I was keen to try again having tasted it at the winery (Viñedos de Paganos) in Paganos, near Laguardia, back in 2013 and having two magnums (of an earlier vintage) of it in my wine room. I am a big fan of Marcus Eguren, who makes this wine. He is one of my favourite wine makers in Spain. 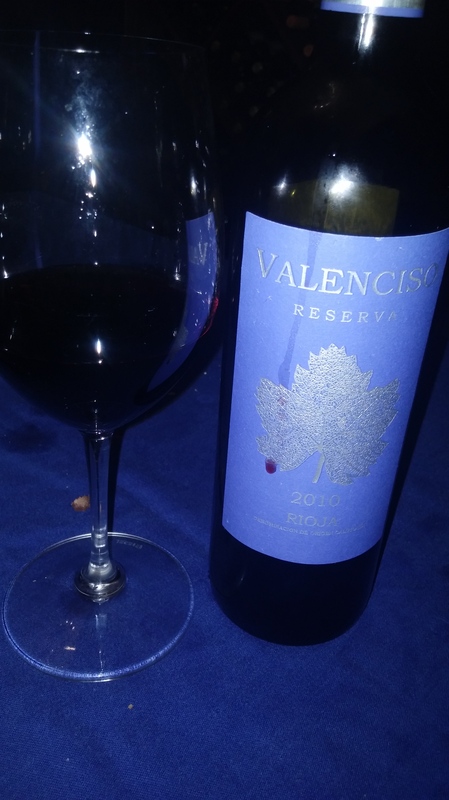 Luis Gutierrez from the Wine Advocate and the Wine Spectator both rated the 2013 of this wine at 93/100 and, my bible for Spanish wine, the Penin Guide gives it a whopping 94/100. This is suggestive of a bloody good wine. Despite the less than stellar year this was a lovely drop, which went perfectly with the txuleton and the oxtail. A really complex nose with a mix of red, black fruits, floral notes and a touch of spice. On the palate there was intense dark fruits, licorice, a touch of smoke, well integrated tannins and a distinct minerality. Fantastic length on this wine with the flavours persisting and evolving in the mouth. Still a bit young perhaps, but it is drinking very well already and it will develop nicely over the next 10 years (one to buy if you see it retail). Keenly priced here at €46 +IVA (retail in the UK it goes for around the £30/€35 mark – so probably well over the £75/€88 mark on a UK restaurant list). Another pearler of a wine. Spicy red fruit, oak and vanilla on the nose. It was pure velvet in the mouth, with smooth red fruits, cigar box and a touch of leathery meatiness. Really lovely wine at a fantastic price and great with the cheese. Quality food and exception value wine made for a very happy party. 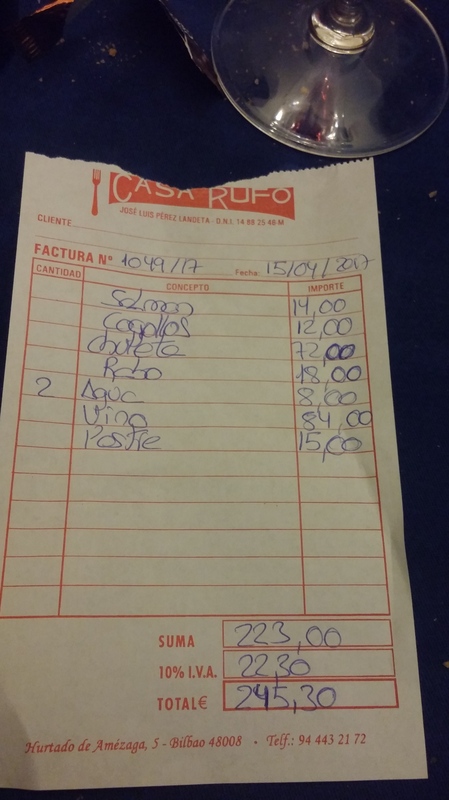 The bill was €245 with IVA (about £208) for 4 of us (not sure where the €18 for the oxtail and €15 for the cheese came from mind, as didn’t equate to menu prices). Bearing in mind the quantity and quality of what we got, I thought it very good value indeed. On the wine front, I reckon we could have paid upwards of £178/€210 (as against €94.5/£80 – with added IVA here) for comparable wines in a UK restaurant (so a saving of probably nigh on £100). 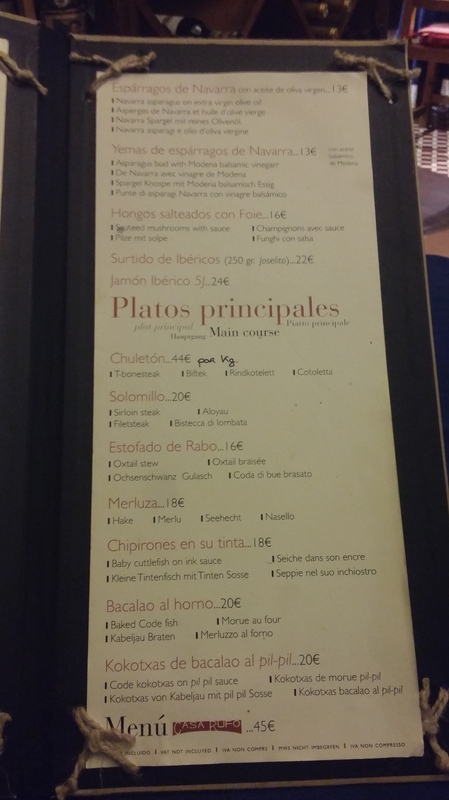 In Spain (unlike in the UK) wine drinkers do not seem to subsidise the food on offer in restaurants, a model I applaud. I don’t mind paying a fair price for both and find the mark ups on wine applied in the UK very irksome. If the Spanish can do it why can’t we? Would I go back? Definitely – great little place in a great city (on the food front it perhaps is viewed as playing second fiddle to Donostia San Sebastian, but – as with anywhere in Pais Vasco it has a fantastic food culture – it is also great for pintxos and food in general and is markedly cheaper than Donostia San Sebastian) and if you are there Casa Rufo is a great option for both steak and wine lovers. Art is a big thing in Bilbao, with the Guggenheim (perhaps I am a Philistine but I got and appreciated about 20% of the stuff in that place, with the rest seemingly done by three year olds – one piece was produced by a bloke pouring 20 gallons of blue paint on a canvas and a woman then rolling around in it, which might be art to some but it is a con man taking the p#ss if you ask me) and other museums, but food is more my bag if I am honest and there is a real art to cooking a steak as good as the one at Casa Rufo. 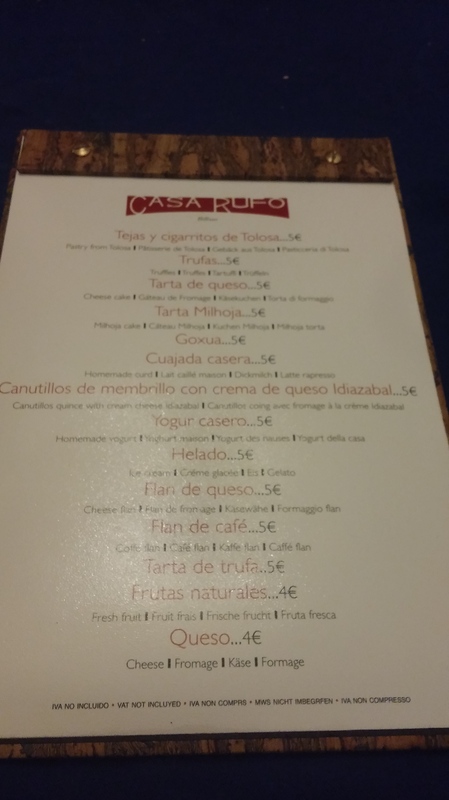 If you want to experience something similar (with perhaps a bit more refinement) to the food at Casa Rufo, but closer to home, try Asador 44 in Cardiff (bill will be a fair bit more I fear). 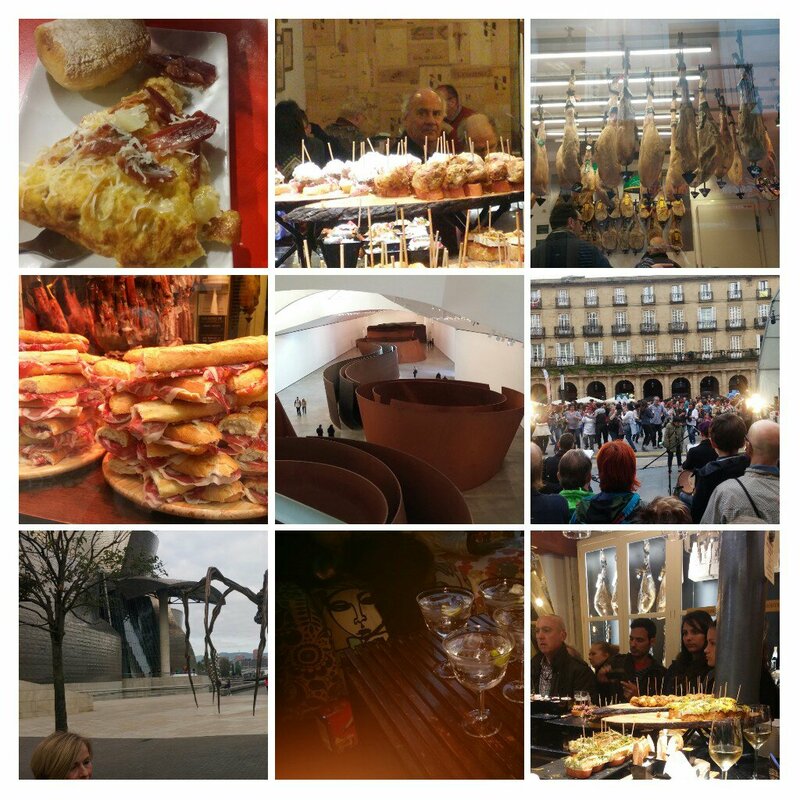 Address: Hurtado de Amezaga Kalea, 5, 48008, Bilbao, Espana. You can book via the Fork on Tripadviser (which was a good option for me as they didn’t reply to my emails – sent in Spanish – and my Spanish is not up to much of a phone conversation). 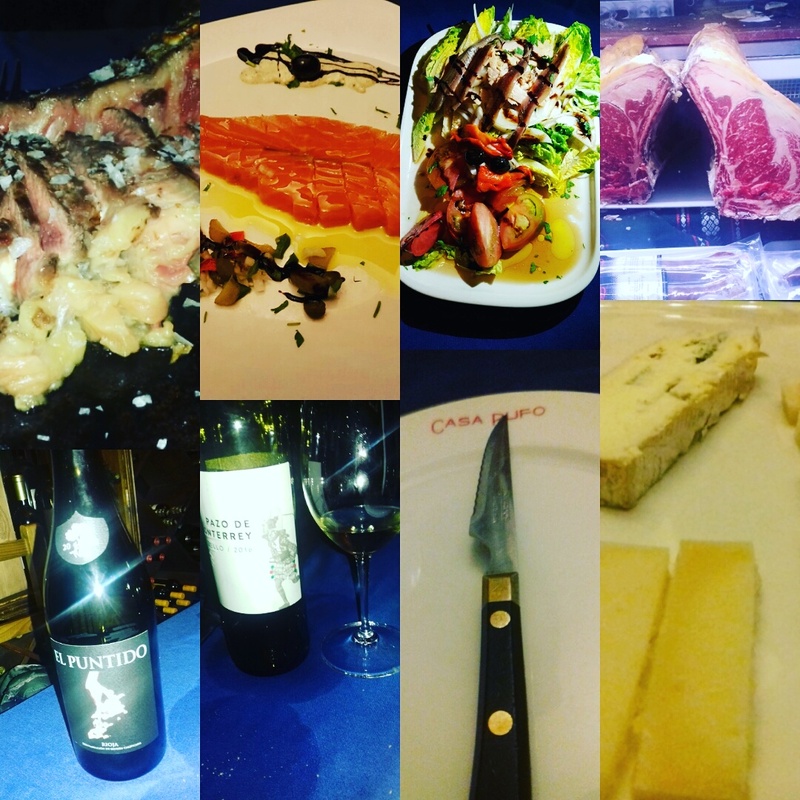 This entry was posted on Apr 23, 2017 by solicitingflavours in albarino, Alternatives to sauvignon blanc, Asador 44, Barbecue, beef, Bierzo, Bilbao, Casa Rufo, Charcoal BBQ, cheese, Drink, Dry aged beef, Dry white wine, fish, Food, Food and wine products, Galcian white wine, Godello, La Rioja Alavesa, La Rioja Alta, Lunch, lunchtime, Mencia, outside UK, Outside Wales, Pais Vasco, Priorat, Red Wine, Rekondo, restaurant review, review, Ribera del Duero, Rioja, seafood, Spanish wine, steak, Tempranillo, Terra Guada, Toro, txakoli, Uncategorized, White wine, Wine, wine mark up, wine pairing, wine pairings.